Our filling pumps are suitable for filling liquid products (oil, perfume), semi-viscous products (shampoo, lotion) and viscous products (cream, toothpaste) into most types of bottles anf jars from 5mL to 1L. Pôle Cosmétique can also take care of all the steps required to deliver finished products in their final packaging under your brand: printing batch numbers, labeling, packing, shrink-wrapping, palletization. 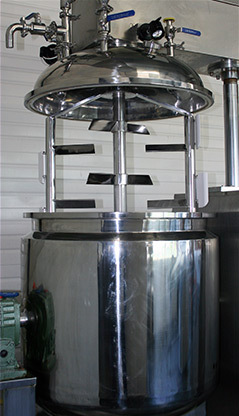 Pôle Cosmétique has a specialization in contract manufacturing of cosmetic products. Our production facility adheres to the latest technology and GMP standards and is fully equipped for small series (50kg / 500 bottles) as well as for larger series (> 1 ton / > 10000 bottles)..
Our tank reactors are suitable for all types of skin care products (face cream, body lotion, etc. ), hair products (shampoo, hair mask, hair relaxer, etc.) and other types of products (toiletries, dental care, mascara, etc.). Our advanced technology provides precise control of manufacturing parameters: electric heating, double jacket cooling, controlled atmosphere / vacuum, triple motion mixing system for complex emulsions (triple blade stirrer, scraper stirrer, rotor-stator), kettle for oil phase, etc.